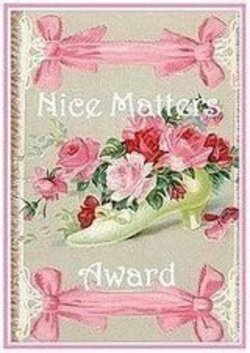 Many thanks to Patience for bestowing this nice award on me! I happen to think Patience is very nice as well, never mind those shopkeepers in New Zealand. An aside Patience, my husband thinks everyone in New Zealand is infinitely nice and he is determined to migrate there. I keep getting New Zealand travel information from him in my inbox. Now, at least I feel like I have a friend there should he follow through on his plans. Dawn is nice, nice, nice,. I love Dawn's blog. It continually inspires me. Dawn has said she blogs because she loves her life: her family and her faith. And she just wants to share it. That joy is so effusive both on the blog and in person. Dawn is genuinely nice. "Oh, and," she added "you can always count on her to go and get a latte if you really, really want one." Well, yes dear, there is that. Very nice. Kim is nice in person, too. She is smart and wise and warm and ever-so-committed to holiness. With Kim, I know that only a phone call away, there is good common sense, warm-hearted inspiration, and a swift kick in the pants if necessary. And there always is the offering of her rosary--the nicest thing she could do. She lives what she believes--and blogs-- and she blesses us abundantly in the genuine sharing. Bridget is very nice in person--and very tall. I am very short. We look funny together and our height difference belies the fact that our hearts are really in the same place. From Bridget, in real life, I have learned more than I could ever share about being a nice wife. And really, those might be the most important lessons of my lifetime. Finally, Mary is nice. She's just so way nice I think she might be my dear husband's favorite person of the summer. I so loved meeting Mary in Denver and then having the unexpected joy of having here in my neighborhood with her children just a few weeks later. Mary is a glowingly nice combination of gentle mothering and brilliant home educating. That's one nice mom! So there you go! Have a very nice Sunday! I'm off to swelter on the sidelines again today. Four soccer games and a football game today. Please pray about the heat index. It's exceedingly difficult to be nice when one is hot.